Like you I didn't want to spend the money on the tool that I'd use once or twice so I made one out of a frying pan. First I held a piece of paper to the face of the crank pulley, than took a pen and punctured the paper where the holes are that the subie tool utilizes. After that I held the paper to the frying pan and drilled out the holes. 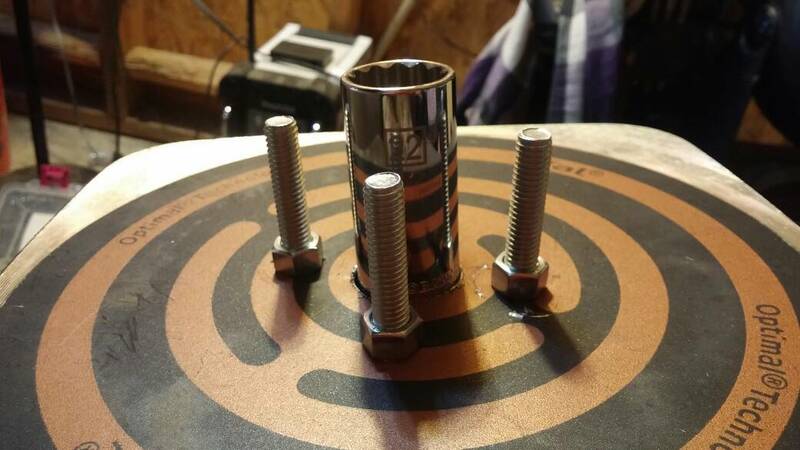 Next put on bolts with washers and nuts to simulate the subie tool . Than drilled a hole through the center for the 22mm socket and so on.. I looked in there i expected to see teeth.. but saw mostly empty space. looking towards the rear i saw some relatively smooth gadget.. i guess its the torque converter. but the teeth were no visible or accessible. i think they are on the rear side of that. 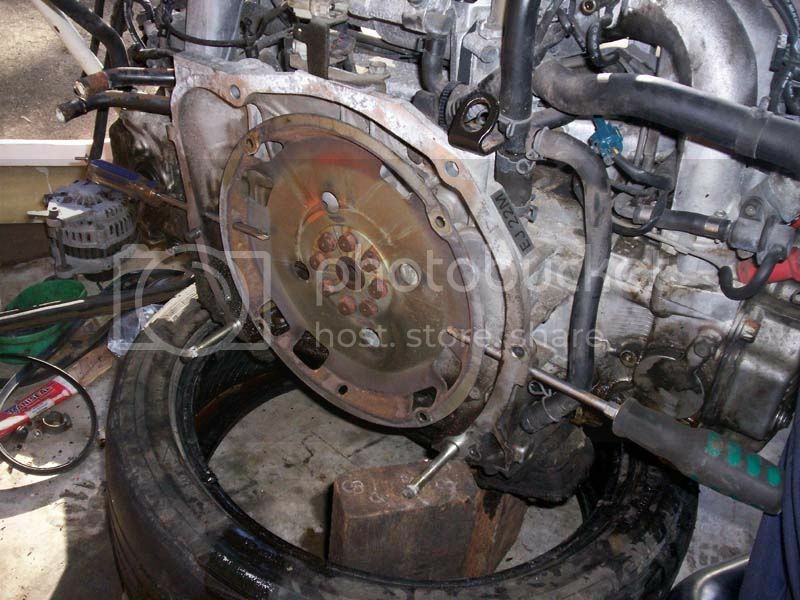 I may remove the starter and get to them that way if its not too much trouble. otherwise i may try the chain wrench with belt. or break down and buy the tool. my crank pulley has very small holes that are unfortunately too small for the 3/8 extensions trick. I purchased and used the Grimmspeed tool when I did my timing belt. It was well worth the $50. Look down the side of your bell housing. You may find a hole that you can stick a screwdriver though. You may be able to use a flat head screwdriver and engage the ring gear. This image illustrates the holes. Hi. I have a video that shows how to remove the crank pulley. Its easy and fast and requires no special tools. I hope this helps. Thanks for watching! When I did this I ghetto rigged a “specialty tool” out of some scrap 2x4 and bolts. This mimicked the function of Subaru’s speciality tool for 1000x less. I wish I had kept pictures. The easiest way is to put a socket with a long breaker bar and a pipe on the bar on the crank pulley bolt. Then position the bar and breaker pipe on the ground or against the underside of the car chassis. Make sure you have jammed the bar on the correct side of the car so when you crank the car over on the key the bar locks and stops the crank bolt from turning, whilst the key being turned rotates the crankshaft which loosens the bolt. It only takes 1 or 2 turns of the key for 3 or 4 seconds to loosen. If its auto no 5th gear available. 3 or 4 seconds and you'll potentially run the crank bolt all the way out and into your radiator fans. A half a second is all you need. Correct, all you're looking to do it break the bolt free, so a starter bump is all that's needed. Most Subaru, I take the overflow tank and fans out for working room. Thus no issue spinning the bolt to into the fans. i went to home depot, measured out a piece of pipe to slide over my ratchet. it was about 3-4 feet long and i put every muscle in my body into it. Finally broke loose. the crank method just stalled. Yeah that didn't work the power steering pulley skinned the back of my hand and I almost bled out. DO NOT TRY. How did you manage that? I haven't done the starter bump method with my Subaru, but did with our old Odyssey second time I did the belt - you need to make sure you know which direction the engine rotates, then brace the breaker bar on a frame member or (better) the ground, then just blip the starter. Why was your hand in there when you were trying it? Dude, you did it wrong. If the power steering pulley skinned your hand while it was turning the key inside the car, it went all kinds of sideways. Yeah you gotta have a kung-fu grip to just arm wrestle it.